Whoo hoo, another great display of photos by CCR members! Many thanks to all the entrants for their contributions, and to the members who showed their support by voting. All the usernames of the entrants have now been added to their photos. You can check it out in the Autumn 2010 Photo Contest Gallery. Were you able to guess the photographers? There were a couple of ties, so the "Top 4 Vote Getters" is actually 6 entries. Perhaps the photographers could say a few words about their entries? And thanks Neil and Barbara for organizing and posting. I did recognize Bandit and Dogscool but all the other photos were a mystery to me... loved the one of the woman crouched under the canoe and the two portages of muck and bog; yes, sure brought back *fond* memories ... and feeding the canoe thru the trees was a great shot too, amazing what you can do in times of difficulty. Of course I loved the German Shepherd. I need to get one of those backpacks for my dog. The winner was terrific. 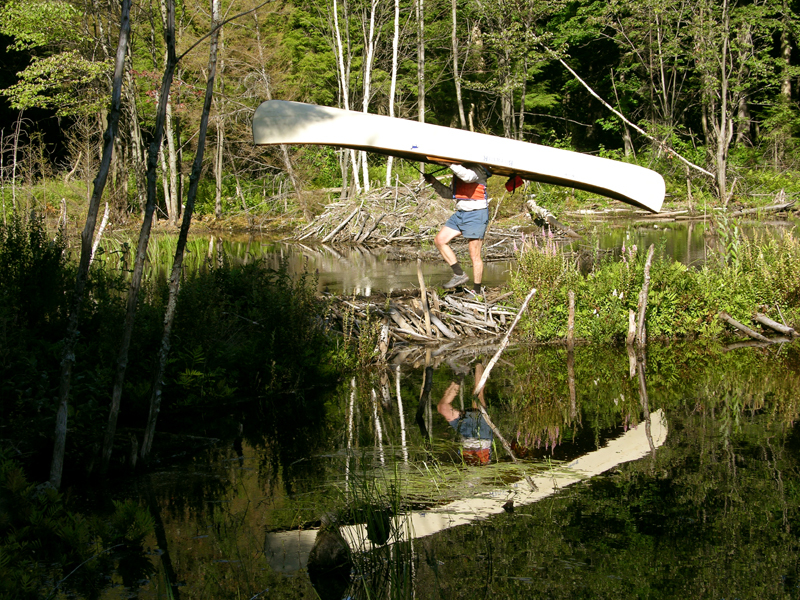 Reflection shots are always my favourite, and walking across a beaver dam carrying a canoe just priceless. Congrats!!! Oh they were all good. I was so surprised to see another winter shot and the snowshoes made that one quite special. Mine was taken early last March. The Madawaska was flowing and the ice had melted off the middle portion of Rapid Lake so off we went for a paddle. I was dipping my paddle into ice and slush for much of it... reminded me of the consistency of my wine when I leave it in the freezer too long! Thanks to everyone for entering and congrats all! I've been a lurker on this site for a long time but the portage theme for a photo contest was too much of a temptation so I joined and submitted my photo. Thanks for organizing the photo contests. Great fun. 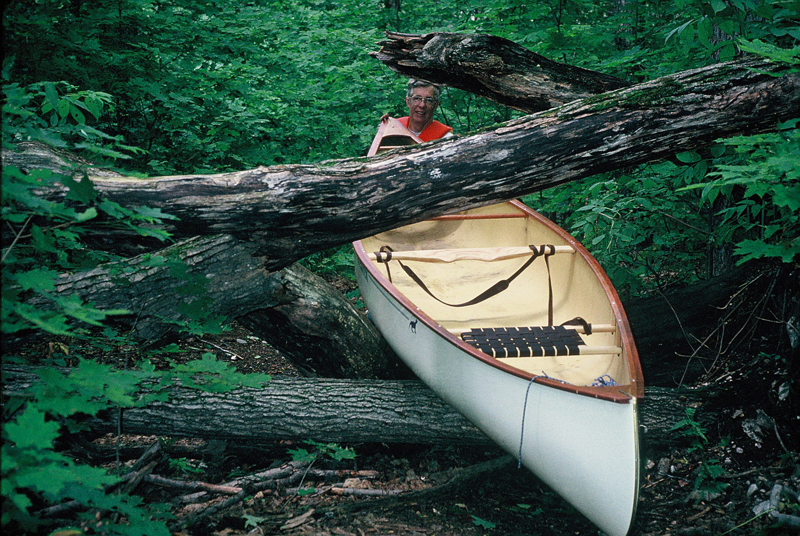 The "canoe in a tree" photo was taken back 1997 in the days of film cameras. Remember them? My husband and I had been windbound on OSA Lake in Killarney. We knew that there was an old portage trail from OSA to George Lake that we had last used in 1974. If we crossed through there, we could avoid going east against a strong wind. The park hadn't marked the trail on any of their maps for years but since we could get to it we decided to take it. Much of trail was in reasonable shape but there was at least one significant problem. I waited with the camera just to see what my husband would do when he got there. Great pictures - it was hard to select the best, thanks to organizers and all those who submitted their pictures. 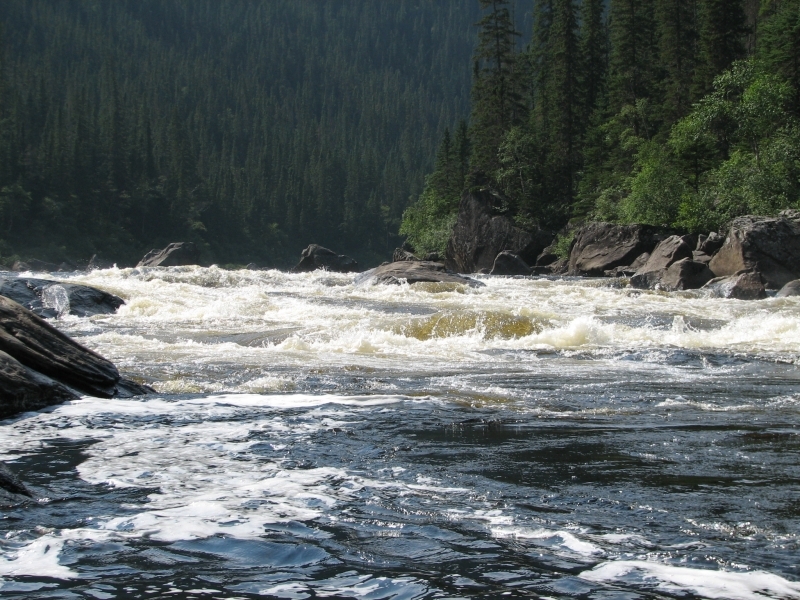 Question to mars - is this Moisie River (whirlpool rapids) portage around the last ledge? It brings back vivid memories for me. 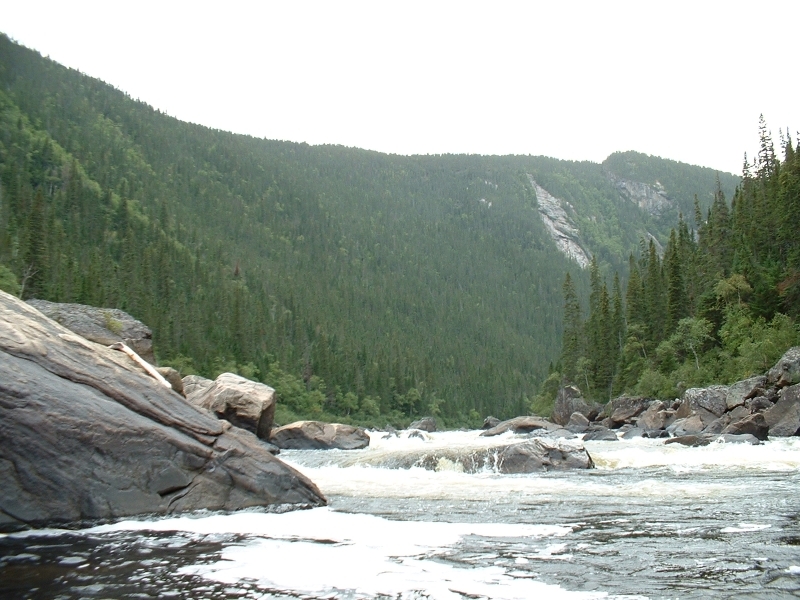 Question to mars - is this Moisie River (whirlpool rapids) portage around the last ledge? I was wondering exactly the same thing! I don't know it as "whirlpool rapid" but rather as "that rapid where we messed up". I was never in the position where the picture was taken but those big rocks upstream look very familiar. Re the beaver dam portage. This is really embarrassing. I have been caught out as a cheat. Not as an intentional cheat but a cheat non the less. Ok, here is the confession/explanation. I have enjoyed the photo contests. 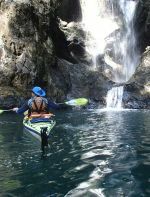 It is great seeing everyone's canoeing pictures but it has also been a great reason to sort through my old pictures to find one that fits the topic. Lots of good memories. However, as soon as I saw the theme was Portages, I knew which picture I wanted to enter. I had been using one in my talks about the Group of Seven painters which fit perfectly. I didn't go back and look through my old pictures. I just entered it right away. 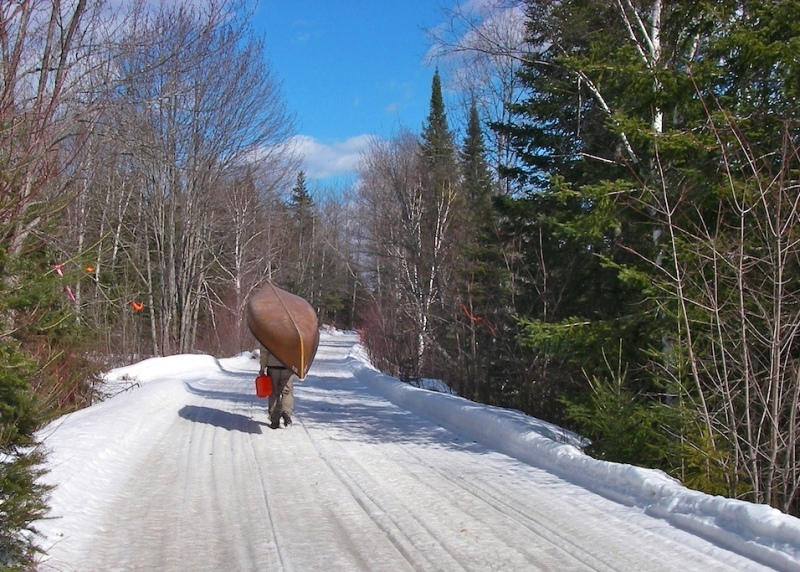 The picture shows a carry over the beaver dam on the portage from Nellie Lake to Grace Lake. The guy is stepping gingerly to avoid slipping and falling off into the pond. Great. But, here's the trouble. Shortly after entering the photo, I realized that those ugly legs are mine. I didn't take the picture! I'd entered someone else's photo. I had cheated. It was taken by my daughter-in-law in 2004. 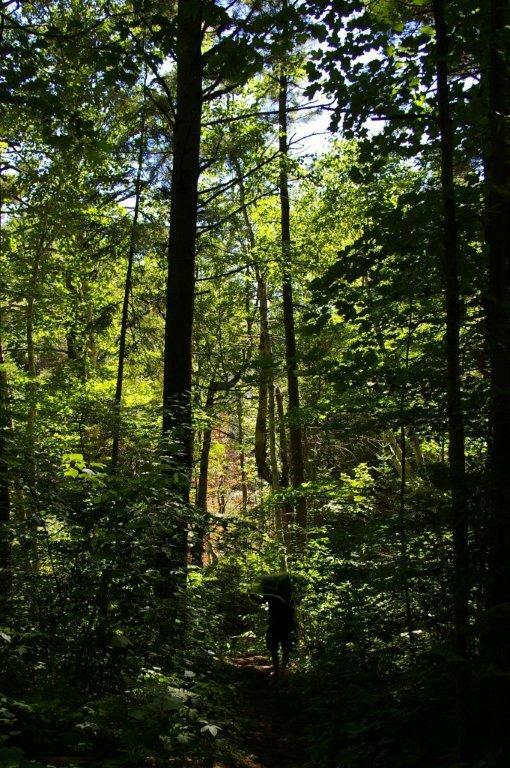 We like the picture of our son carring the canoe through the tall trees. We have the picture framed and quite often have to point out the canoe. It shows to us the vastness of the forest we pass through on our journeys. This photo is definitely on the Moisie River (2006 trip) & the water was pretty high. 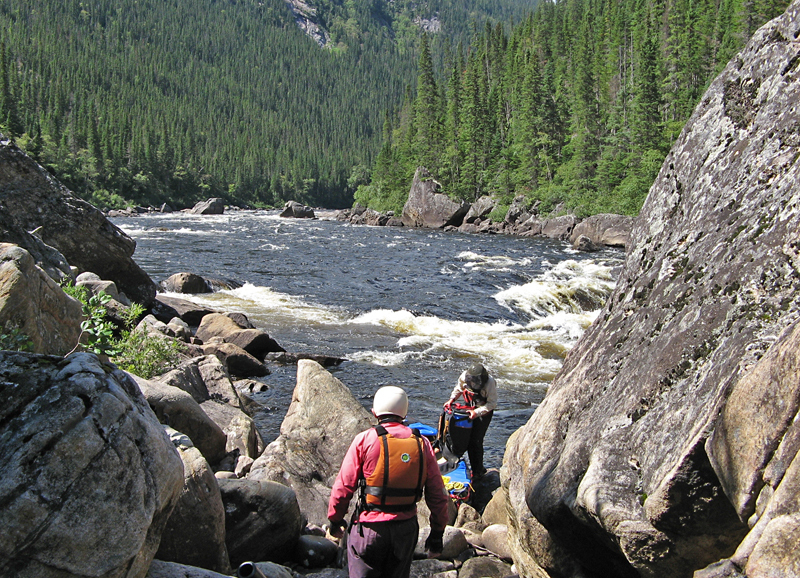 I don't think it is the ledge you are thinking about - it is an R4 with no particular name that we know - it had no portage, was about 1 day upstream of Fish Ladder & we scrambled a few hundred meters over up to house-size rocks. One of many very memorable portages on the Moisie!! This photo certainly brings back many memories for me on the Moisie & epitomizes the character of this river! I too am enjoying these photo contests a lot - it's an opportunity to see others' photos & vicariously enjoy their experiences plus I search through my own photos, enjoying trips again & again. That's the one! (km190 on Lester's map) The big rock upstream on river right caused a bit of a problem in 2003, we ended up swimming the pool below just managing to drag ourselves to shore between the small ledge downstream and the little pour-over in the foreground. The only thing lost was a paddle which we found jammed into a micro eddy just about where the person with the barrel is standing. Yes - that's got to be the one....& there was no way we were running it! But getting through those rocks was something else! Lester (Laco) was on this trip also....keeping his great & accurate records! The photos were great. I really like the dog picking his (her) way through the rocky portage - even four leg drive isn't easy. The explanations gave life to them. It makes me start thinking of workouts to get my 64 year old shoulders and and legs ready for next season. 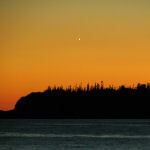 The winning photo by jcw41 is now posted on the site Home Page - If you'd like to see it click here: http://www.myccr.com . Oops! I forgot to check up on the photo contest! I'm not often on this site, but was pleasantly surprised by all the votes I got when I did get around to checking it out. Thanks everyone! Congrats to the winner, despite his mistake. Always nice to see other people's pictures and hear the stories behind it. The story behind my picture was an attempt to squeeze in one last canoe trip in early December. 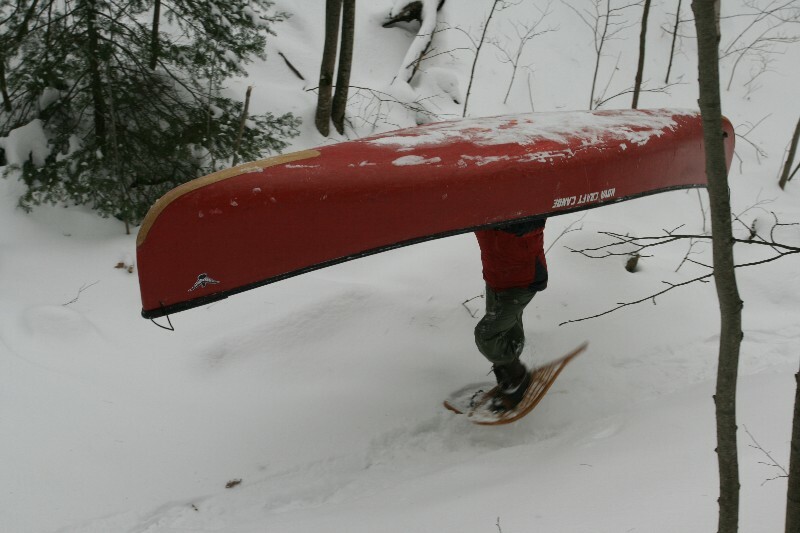 We were going to paddle around Beausoleil Island but a huge snow storm stopped it. We ended up on MacDonald Lake where we camped and literally got buried. The snowshoes unexpectedly came in real handy. It isn't a great portaging picture but i figured its uniqueness would make it interesting. Funny to see another portaging picture in the snow! Sorry for the very tardy reply!